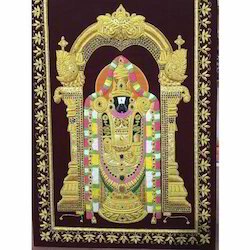 Leading Manufacturer of indian embroidery jewel carpet, antique embroidery jewel carpet, silk zari floral jewel carpet, antique jewel stone carpet, antique jewel zari embroidered carpet and decorative embroidery jewel carpets from Agra. We offer handmade collection of Indian Embroidery Jewel Carpet that exhibit the distinct essence of Indian tradition. Jewel Carpets are a magnificent and exceptional art of Zardozi. This art has thrived in Mughal era and received patronage of Kings and Royal families. Semi-precious stones, thousands in numbers-depending upon the size and design, like jade, onyx, corals, lapis, turquoise, malachite, moonstone, -eye etc. are meticulously crafted and fixed in Gold-like and/or silken threads, to produce a fine art. 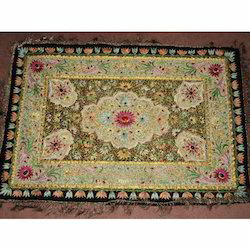 Beautified with multicolored jewels in alluring designs, these charming jewel carpets are used as wall hangings. They exude a magic spell in the surroundings With exceptional quality these jewel carpets are designed to perfection to bring a sense of style and elegance to the indoors. Our exquisite range is known for its beautiful patterns that are a perfect amalgamation of traditional weaves and modern designs. These jewel carpets have gained prominence across the globe with their ethnic touch and attractive prices. 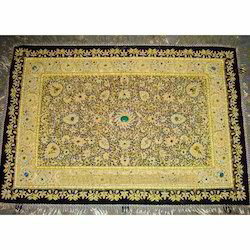 We are instrumental in providing our clients a comprehensive range of Antique Embroidery Jewel Carpet. 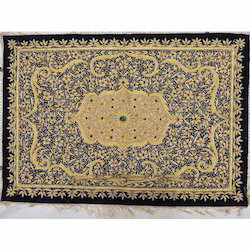 The offered jewel carpet is made by making use of Zari and Resham with 100% hand embroidery. 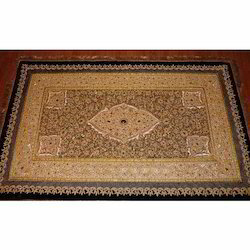 As well, our jewel carpet can be used as wall hangings, our offered carpet is known for its features such as excellent finish & high durability. 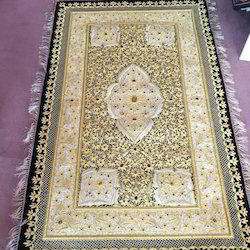 Our customers can avail this jewel carpet from us at market leading rates within a given time frame. We are renowned as one of the most prominent manufacturers, exporters and suppliers of a huge gamut of Silk Zari Floral Jewel Carpet. Our carpets are fabricated using high grade quality thread and yarns. Our provided carpets can be purchased in numerous sizes, stylish patterns, appealing painting work, smooth texture, multiple designs, shapes, durable nature and worth praising prints. Our carpets are highly used to increase the decor of homes, restaurants, corporate offices, hotels and many other establishments. These are available with us at very nominal prices. As an eminent enterprise, we manufacture and supply a supreme class collection of Antique Jewel Stone Carpet. This jewel carpet is designed by our experts from the top quality of material and stone work to give them a royal & antique touch. The given jewel carpet is widely known among clients owning to their features such as excellent finish, high durability, soft texture and tear resistance. 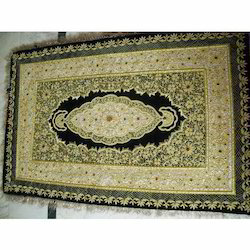 We are offering this jewel carpet at nominal rates without compromising with the quality. By keeping track with the market developments, we are engaged in offering an extensive range of Antique Jewel Carpet Zari Embroidered that is demanded for its stylish patterns, appealing painting work, smooth texture & multiple designs. This jewel carpet is designed with precision employing creative techniques in fulfillment with the trends of market. 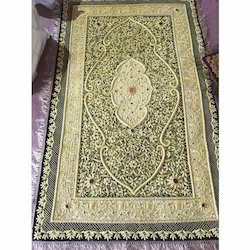 Our given jewel carpet is available in different traditional designs and patterns. It is a gifted given by us the ancient rulers of India called mughal emperors of India. The Jewel Carpet Zari Embroidery is a highly crafted item with hand embroidery and then some semi precious stones used in the work makes its name “JEWEL CARPET”. We use the best quality raw materials to manufacture our Jewel Carpet Zari Embroidery so that there is no compromise in their quality. We also offer exclusive designs and colors in our Carpets. These Carpets can give a grace to your interiors and that too at quite affordable prices. We make sure the prices and reasonable so that everyone can avail them easily. 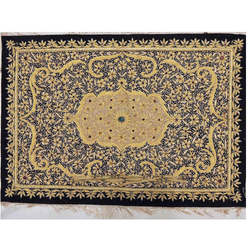 We are one of the recommended Jewel Carpet Zari Embroidery Exporters and Suppliers in India. 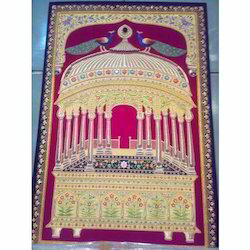 We offer a wide range of top quality Indian Hand Embroidery Jewel Carpet, which are a perfect example of immaculate artwork done with zari and gemstones by our finest craftsman's. This art was born in the Mughal's Empire and since then it is passing down through generation to generation. 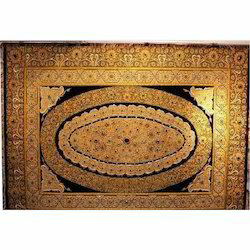 Our Embroidered gold Jewel Carpets are available at industrial leading price. We offer handmade collection of Hand Embroidery Jewel Carpets that exhibit the distinct essence of Indian tradition. Jewel Carpets are a magnificent and exceptional art of Zardozi. This art has thrived in Mughal era and received patronage of Kings and Royal families. We are instrumental in offering an exclusive collection of beautifully crafted Hand Embroidery Jewel Carpets to our clients. These Carpets are hand tufted or handmade by using high-quality fabric. The unique and fantastic designs of these Carpets make them most liked by clients. 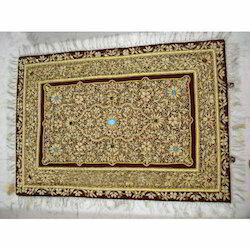 Owing to our proficiency in this domain, we are offering our clients a wide gamut of Grand Embroidery Jewel Carpet. The offered jewel carpet is perfectly handcrafted by our craftsmen and is made of the finest quality material that gives it a royal touch. 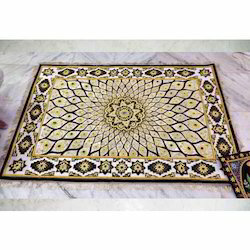 This jewel carpet is best for decoration / gifting purpose. Moreover, we are providing our jewel carpet in different sizes & customized options to meet the varied demand of clientele. We are instrumental in manufacturing, exporting and supplying a wide range of Hand Embroidered Jewel Carpets. Our offered carpet is designed using optimum grade basic material in compliance with the well-defined quality parameters. Can be used as wall hangings, our offered carpet is known for its features such as excellent finish, high durability, soft texture and tear resistance. 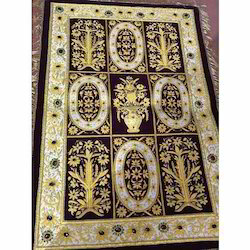 Available in various specifications like sizes, colors and designs, this Hand Embroidered Jewel Carpets can be availed by clients from us at market leading prices. We take enormous pride to commence ourselves as a renowned manufacturer of a decorative collection of Hand Embroidered Kashmiri Jewel Carpet. Designed to perfection under the guidance of skilled craftsmen by using premium grade fabrics and materials, these hangings are acknowledged for their smooth finish, modular look and impeccable design. Perfect for decorating interiors of homes, offices and hotels, our Hand Embroidered Kashmiri Jewel Carpet is offered in multitude colors and designs to opt from. Furthermore, our clients have the advantage to customize these hangings as per their requirements. 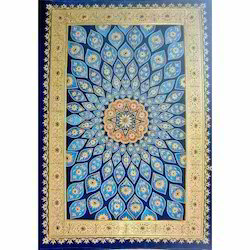 Hand Embroidery Jewel Carpet offer by us comprise an exciting and alluring collection of Jewel Carpets that are designed using quality fabric choices and decorative accessories, thus making these widely used as decorative pieces. Having high demand because of its classy designs as well as traditional fished looks, the superior color combinations made available in these as well as their availability at market leading prices also make these one of the most preferred choices of the market. Backed by the team of industrial experts, we are able to offer an huge array of Kashmiri Hand Embroidery Jewel Carpet to our clients. These Carpets are aesthetically designed and made keeping in view the various needs of the clients. Our offered Carpets are demanded in the market for their superb finish, alluring look and longer life. 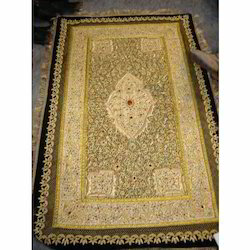 Moreover, all these Kashmiri Hand Embroidery Jewel Carpet are rigidly tested on various quality parameters to deliver a flawless range at the client's end. We are a quality conscious company and believe in producing products that can withstand all quality parameters. With our long experience in Indian tradition art, we produce Zari Embroidered Jewel Carpets, made from finest materials and in delicate designs and patterns. Rigorously checked on different parameters and at different stages of production, these Zari Embroidered Jewel Carpets highly durable products that serve for more than a lifetime. Our company is offering a handmade collection of Handmade Zardozi Royal Jewel Carpet that exhibit the distinct essence of Indian tradition. 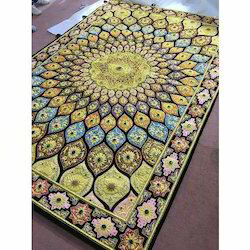 These Carpets are a magnificent and exceptional art of Zardozi. This art has thrived in Mughal era and received patronage of Kings and Royal families. We provide them at competitive prices to our respected customers. 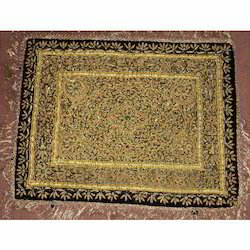 Decorative Kashmiri Jewel Carpet is a magnificient and exceptional art of Zardozi. This art thrived in Mughal era and received patronage of Kings and Royal families. Semi-precious stones, hundreds in numbers depending on the size and design. 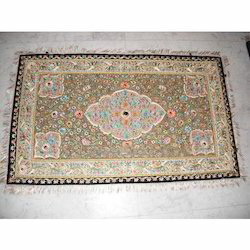 We are one of the reliable Jewel Carpet Suppliers in India. 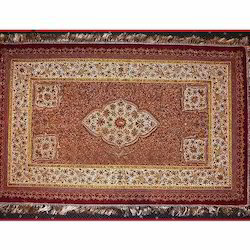 We offer an exclusive range of Kashmiri Jewel Carpet which are of optimum quality. We offer the best designs and colors in our Woollen Rugs which cannot be availed through anywhere else. We use the best quality material to manufacture our Woollen Rugs so that there is no compromise in their quality. We offer our Kashmiri Jewel Carpet at quite reasonable prices and also deliver them well within the stipulated time avoiding all delays. With time and diligent effort, we have been able to become one of the reliable Woollen Floral Rug Manufacturers as well. 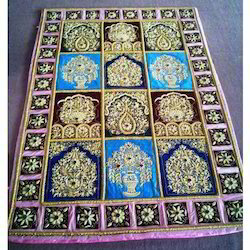 We are offering our clients an excellent quality range of Zari Hand Embroidery Jewel Carpet. These are intricately Hand Embroidered with Zari and Embellished with stones. By using premium quality velvet base, these carpets are made from zari gold material. Our offered Handcrafted Zardozi Jewel Carpets can be availed in different sizes, stylish patterns, appealing painting work, smooth texture, multiple designs, shapes, durable nature and worth praising prints. These designer carpets are used to enhance the decor of homes, restaurants, corporate offices, hotels and many other establishments. 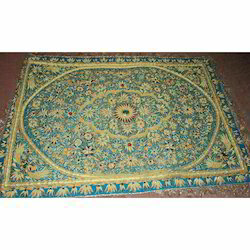 Colorful handmade Indian Decorative Embroidered Jewel Carpets, perfect as a Jewel Carpet. Sewn embellishments with colorful threads lay designs throughout the entire piece. it is often used to give a traditional accent to the room. In bright traditional colors embroidered with the simple colored threads, they catch the attention.The Exotic Style and Diffrent kind of Hand work in this Decorative Embroidered Jewel Carpets give life to your room and offices. 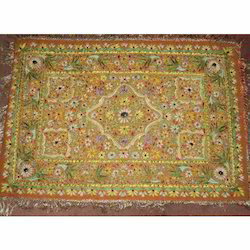 We are one of the illustrious Manufacturers, Suppliers and Exporters of Hand Embroidered Jewel Carpets in the market. 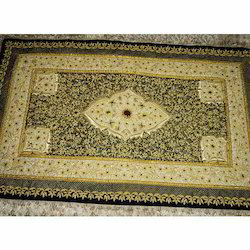 Our Hand Embroidered Jewel Carpets are available in a variety of designs and at the most affordable price range. 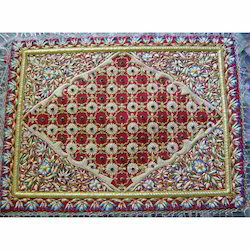 We make use of the optimum quality raw material in manufacturing Hand Embroidered Jewel Carpets. Besides this, we have a highly skilled team of professionals who take care of all the aspects of manufacturing unique Hand Embroidered Jewel Carpets. 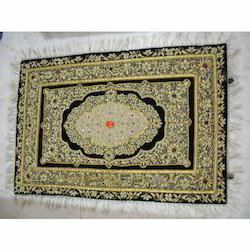 To satisfy our customers, we are engaged in offering wide range of Designer Red Embroidery Jewel Carpets. The attractive design of this Designer Red Embroidery Jewel Carpet is highly appreciated by clients. We offer this Red Embroidery Jewel Carpet to the clients at market leading prices. Also, we keep the various demands and requirements of the clients in our mind while developing the range. 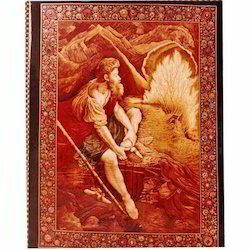 Colorful handmade Red Embroidery Jewel Carpet, perfect as a Jewel Carpet. In bright traditional colors embroidered with the simple colored threads, they catch the attention.The Exotic Style and Different kind of Hand work in this Jewel Carpet give life to your room and offices. We are instrumental in offering a wide range of Silk Kashmiri Jewel Carpet that are specially designed to meet the various requirements of customers. It is crafted using superior quality raw material by our skilled and dedicated team of professional. We provide these at most affordable price range. 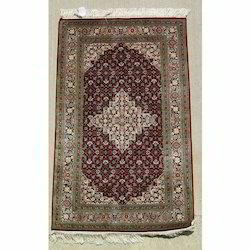 We are one of the reliable Hand Knotted Jewel Carpet Suppliers in India. 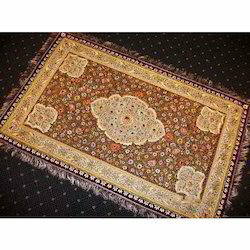 We offer an exclusive range of Hand Knotted Jewel Carpet which are of optimum quality. We offer the best designs and colors in our Woollen Rugs which cannot be availed through anywhere else. We use the best quality material to manufacture our Hand Knotted Jewel Carpets so that there is no compromise in their quality. We offer our carpets at quite reasonable prices and also deliver them well within the stipulated time avoiding all delays. 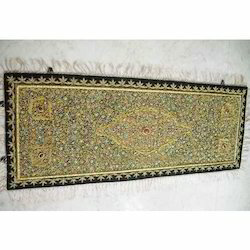 With time and diligent effort, we have been able to become one of the reliable Hand Knotted Jewel Carpet Manufacturers as well. 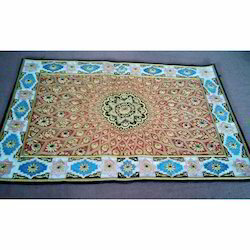 We are one of the illustrious Manufacturers, Suppliers and Exporters of Hand Embroidery Jewel Carpets in the market. 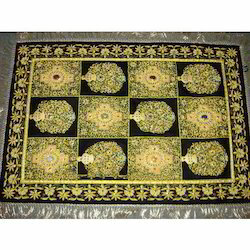 Our Hand Embroidered Jewel Carpets are available in a variety of designs and at the most affordable price range. 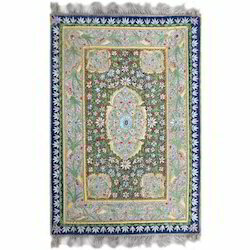 We make use of the optimum quality raw material in manufacturing Hand Embroidered Jewel Carpets. Besides this, we have a highly skilled team of professionals who take care of all the aspects of manufacturing unique Hand Embroidered Jewel Carpets. 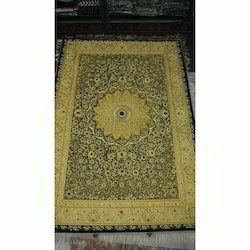 For our valuable clients, we are involved in offering a comprehensive array of Kashmiri Embroidery Jewel Carpet. These products are fabricated by our professionals possessing years of experience in their concern field, utilizing premium grade raw material and latest techniques so as to maintain the set international standards. To make a qualitative dispatch from our end, inspection of the offered wall panels, on various parameters is done. 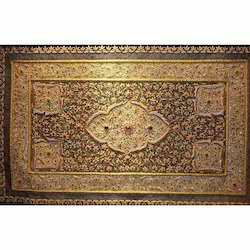 The Jewel Carpet is a highly crafted item with hand embroidery and then some semi precious stones used in the work makes its name “Kashmiri Embroidery Jewel Carpet” and the detail of the carpet folder may be used for SILK Carpets only. We are engaged in offering an extensive collection of high quality carpets to our valuable customers. Because of the intricate designs, vivacious colors and rich patterns, these carpets are immensely appreciated by our domestic clients. Our professionals put in their meticulous efforts while procuring these carpets from renowned vendors, who use latest technology to incorporated various designs & patterns while manufacturing these unique and exquisite carpets. These Kashmiri Embroidery Jewel Carpets Available In Various Sizes And Design. 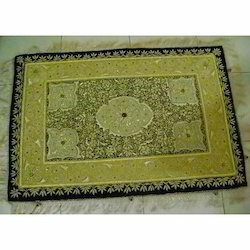 We are counted among the foremost manufacturers and suppliers of a diverse range of Hand Crafted Jewel Carpet. Famous for their traditional appearance, these carpets are used as a perfect match for the various home decor. These carpets are offered in different sizes, designs, colors and patterns to accomplish the variegated expectations of our esteemed customers. Provided Hand Crafted Jewel Carpets are appreciated for the features like high durability, easy maintenance, colorfastness, etc. We are exporters in international market like USA, Europe, Canada, Middle East and Germany. We are known as one of the leading manufacturers, exporters and suppliers of a vast gamut of Indian Embroidery Jewel Carpets. By using premium quality velvet base, these carpets are made from zari gold material. Our offered carpets can be availed in different sizes, stylish patterns, appealing painting work, smooth texture, multiple designs, shapes, durable nature and worth praising prints. These Indian Embroidery Jewel Carpets are used to enhance the decor of homes, restaurants, corporate offices, hotels and many other establishments. 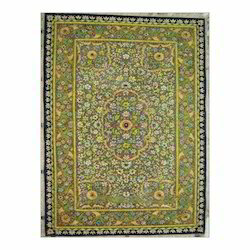 We are known as one of the leading manufacturers and suppliers of a vast gamut of Handcrafted Zardozi Jewel Carpets. By using premium quality velvet base, these carpets are made from zari gold material. Our offered Handcrafted Zardozi Jewel Carpets can be availed in different sizes, stylish patterns, appealing painting work, smooth texture, multiple designs, shapes, durable nature and worth praising prints. These designer carpets are used to enhance the decor of homes, restaurants, corporate offices, hotels and many other establishments. We offer a wide range of Hand Embroidery Arabic Wall Panel that is available in different designs, sizes and colors. These fine Hand Embroidery Arabic Wall Panels is done by highly creative artisans, who bring out exclusive designs. 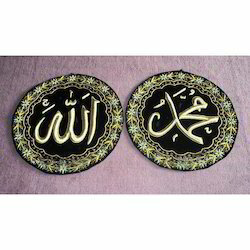 Our Hand Embroidery Arabic Wall Panel are handmade and light in weight. Best quality zari and other materials used in the creation of these decorative pieces lead to their long-lasting finish and quality. Looking for Jewel Carpets ?